This November is the 329th anniversary of the landing of William Penn. 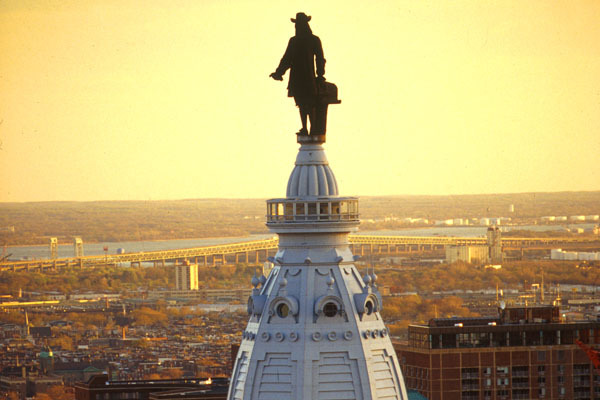 Today, a statue of the entrepreneurial Quaker stands atop the Philadelphia City Hall, looking out over the City of Brotherly Love. (Many people think it is Benjamin Franklin.) 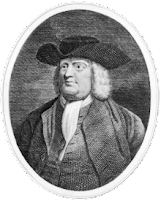 In the early nineteenth century, Americans knew more about William Penn than they did about the Pilgrims who may have disembarked at Plymouth Rock. 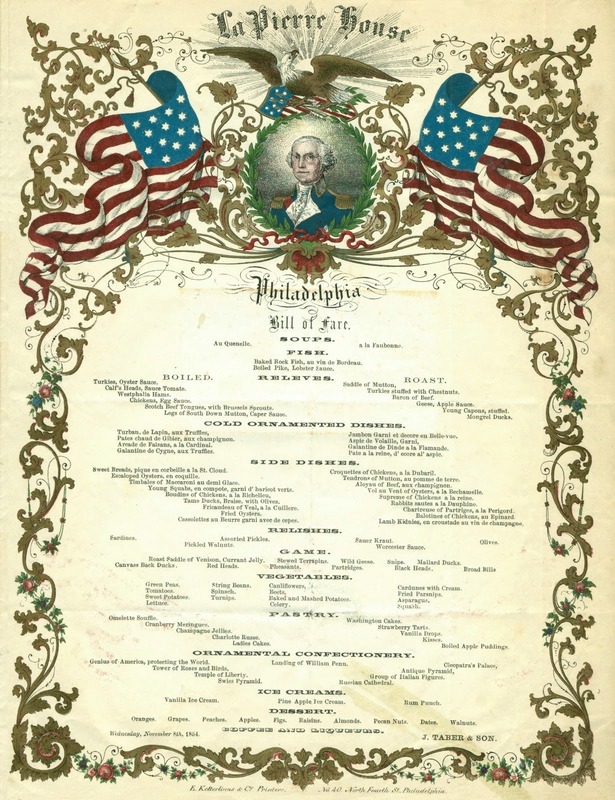 A menu from 1854 reflects the importance once accorded to Penn's arrival in the New World. The menu shown below also has an American Eagle at the top, here perched over a portrait of George Washington who is flanked by national flags, creating a splendid trifecta of patriotic images. Gilded and tinted in a lithographic process using three stones, the menu was made by Eugene Ketterlinus, one of the first printers in the country to produce colored and embossed lithographs. 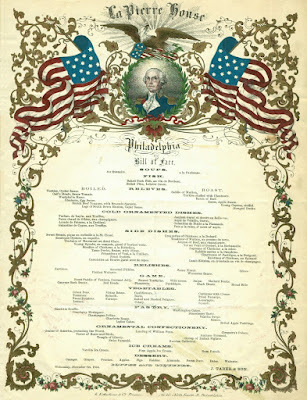 Ketterlinus received an award for his work from the Franklin Institute in 1858, sixteen years after establishing his printing shop at 40 North Fourth Street, a few blocks from the wharves that lined the river where Penn landed. Perhaps William Penn landed in too many places along the Delaware River for his story to have been transformed into folklore. 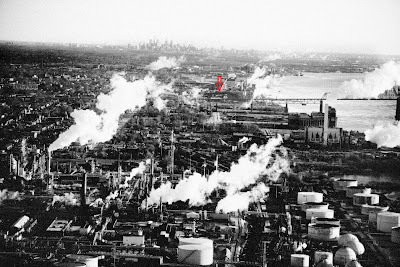 Nevertheless, his monument is still there, situated in an isolated area several hundred feet inland in a decaying industrial area just south of Chester Creek. The red arrow marks the spot on the above photograph; Philadelphia can be seen in the distance. 1. The settlers in the three southernmost counties of Pennsylvania were permitted to split off in 1704, establishing the semi-autonomous colony of Delaware with New Castle as its capital. 2. 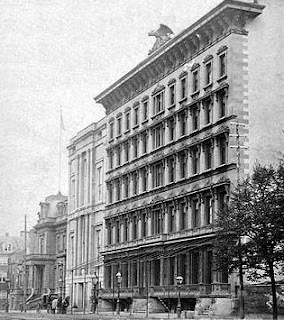 La Pierre House opened in 1853 on the west side of Broad Street, between Chestnut and Sansom Streets. It was designed by John McArthur, Jr., the architect of the Philadelphia City Hall, a landmark building that is topped with a statue of William Penn. La Pierre House, later renamed the Lafayette Hotel, closed in 1900. 3. Various apocryphal stories about the First Thanksgiving became ingrained in the national consciousness. Although some maintain that the first Thanksgiving was held at Berkeley Plantation on the James River in Virginia in 1619, the most prevalent tale is that the Pilgrims celebrated it in 1621. Wonderful post, Henry, and what a menu. You never cease to amaze with what you find!! !